The Asian elephant is the national animal of Thailand, and they have been used for years as working animals, hauling logs in the forest. Nowadays mechanisation is taking over from this work but Thais have realised the appeal to tourists of the elephant and there are camps all over the country where you can go to meet and interact with these beautiful creatures. There seems to be a particular concentration of these camps around Chiang Mai and although we wavered for a while about whether it was something we wanted to do (in particular as there are reports of bad treatment of the elephants at some of the camps), eventually after a lot of research we contacted Patara Elephant Farm and booked onto their ‘Elephant Owner For A Day’ program. The day started very early with pick up at 7.30am (how on earth did I ever get myself to work before 8am five days a week…?). And after collecting a few others around the city we were driven 29km south west of Chiang Mai to the farm. 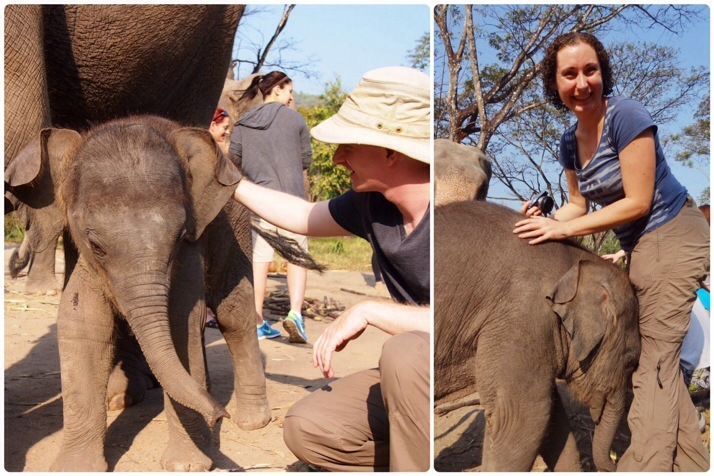 The first activity was meeting the baby elephants. Over the last few years the farm has averaged about four new babies a year and when we visited there were two who were just a few months old. They were extremely cute, quite playful and like small, very solid trains if they decided to walk into you! So cute…but don’t get in their way! After saying goodbye to the babies, the group of about twenty visitors was split into two and taken to separate areas where each person was allocated an elephant. Our group’s leader, Atip, was responsible for teaching us about the elephants, and answering any questions that the elephant handlers (who generally only spoke basic English) couldn’t help with. 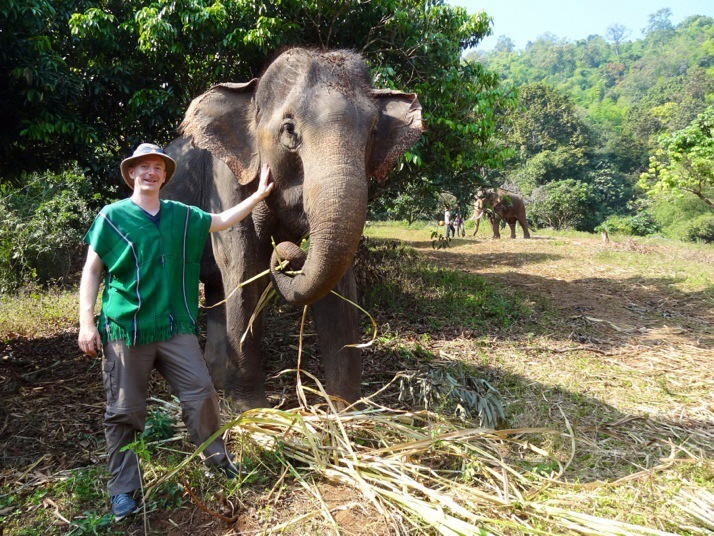 Firstly we had to make friends with our elephant. This took the form of bribery by feeding them bananas and chunks of sugar cane, and we learnt our first two elephant commands, ‘Buun’ which tells the elephant to lift their trunk and open their mouth, and ‘Deedee’ which means well done. 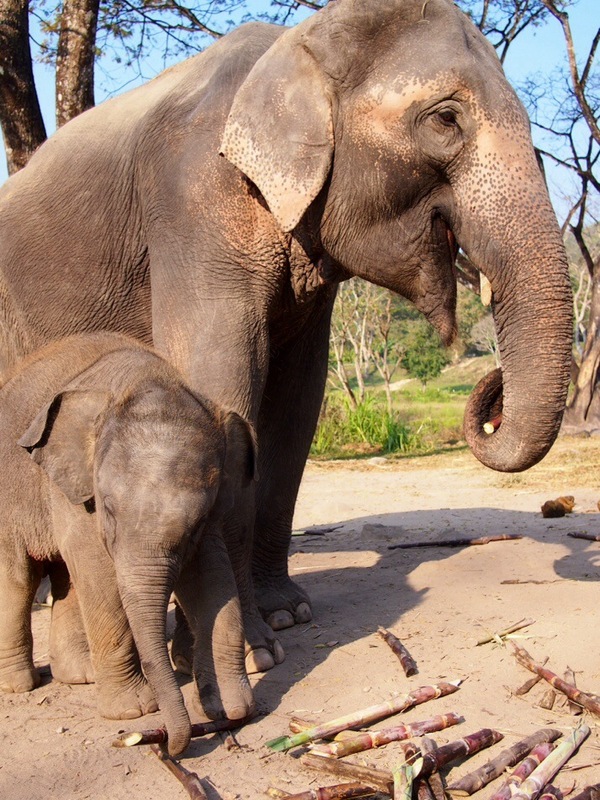 Andrew’s elephant was Merjensai, a 23 year old female with a mischievous 2 year old baby, Yuli. My elephant was Bunjun, a 17 year old male, the only bull elephant in the group and absolutely enormous although very gentle. If you really owned an elephant, you’d need to know how to check she was healthy. There are four things to check. Her ears should flap and she should swish her tail approximately once per minute. This keeps flying insects off, not doing it might indicate a more serious underlying illness. Having made sure that the elephant was suitably dirty from sleeping on the ground last night, we brushed them down with a bunch of twigs (the elephant used for demonstration made us laugh by eating the brush after being cleaned! 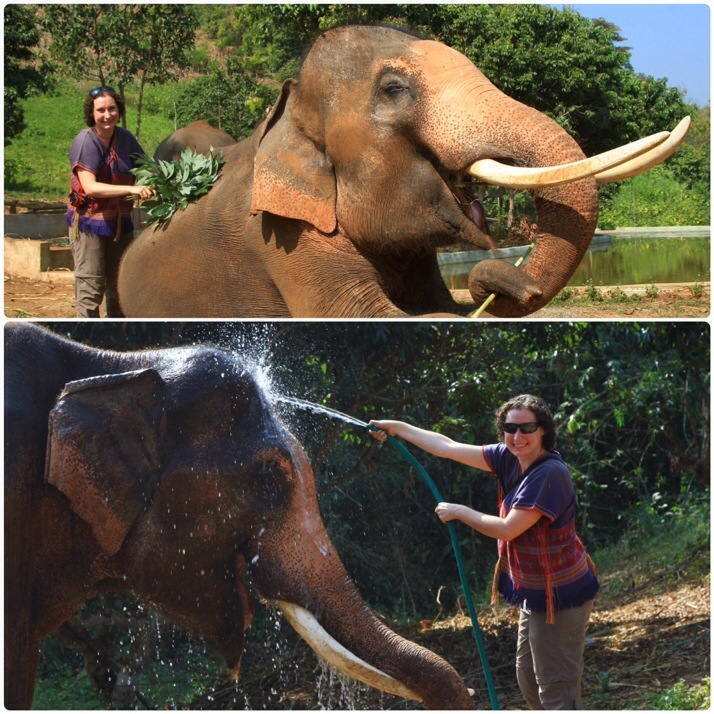 ), washed them off with a hose and gave them a drink – Bunjun liked to have his trunk filled from the hose which he then transferred to his mouth, Merjensai was a bit more direct and just took the hose directly into her mouth! There are a few different ways of getting onto the elephant – by stepping onto the centre of the trunk and having them lift you up onto their head, by commanding the elephant to lie down and then scrambling up, or by stepping onto their right foreleg and hauling yourself from there onto their back. Most people chose the latter method, some managing it more gracefully than others! The correct place to sit is on the elephant’s neck, almost on top of their head with your knees supported by the ears. We were surprised by how much hair the elephants have, and how stiff and bristly it is. Once we were all up, we set off for the hour long ride through the jungle to the river. The group was well spread out and as the elephants walk with a very slow and steady gait it was very peaceful. Merjensai’s baby, Yuli, was very wilful during the walk, often stopping dead in the path or trying to pull bark off trees. 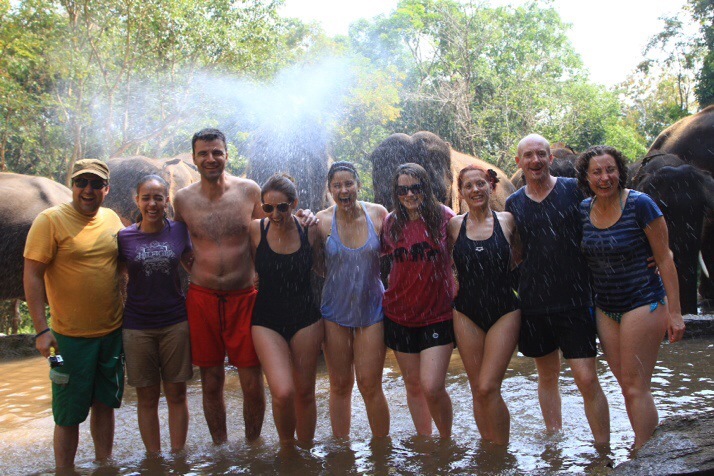 On reaching the river, everyone changed into their swimming gear and got ready to scrub the elephants. Atip explained that this was like elephant skincare and was an important part of keeping the elephant healthy by removing parasites. After a tasty lunch of barbecued meat, sticky rice and fresh fruit, the day ended with a short ride back to the roadside where the vans were parked ready to take us back to our hotels. We were really pleased that we chose Patara, not only is the program extremely well run and all of the elephants we saw seemed well cared for, but they take heaps of photos and videos (and they’re very good at making sure they get everyone) which you then receive on DVD at the end of the day. 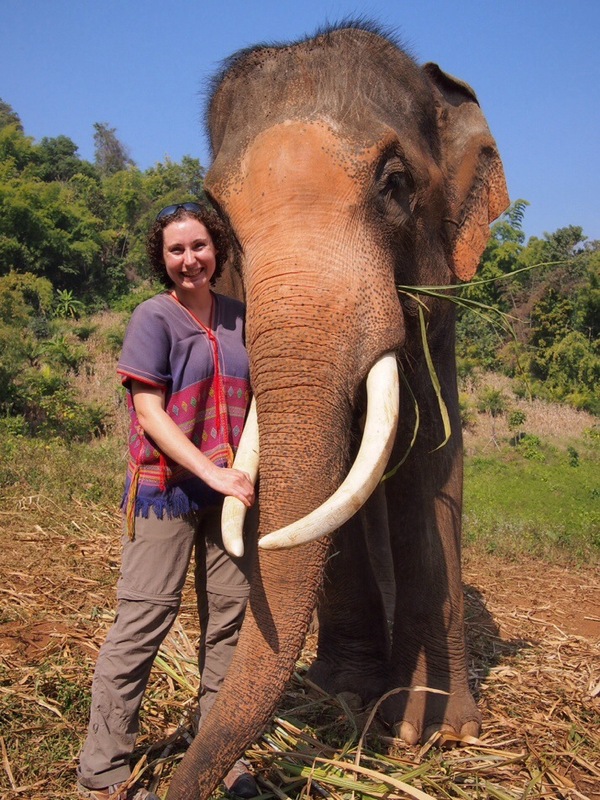 The elephant handlers are also great at taking your own camera and snapping you with your elephant so you’re pretty much guaranteed to come away with some fantastic pictures to help you relive the memories. 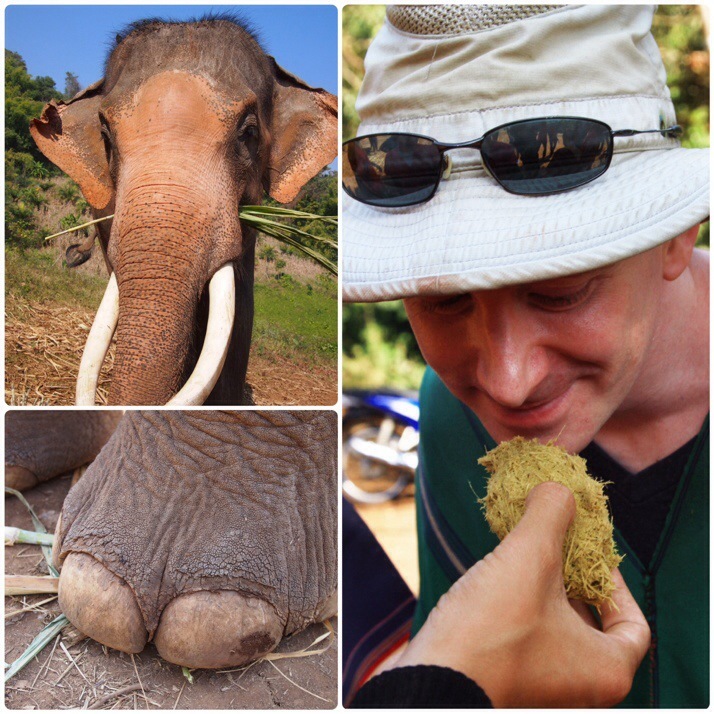 This entry was posted in Experiences and tagged Chiang Mai, elephant, Thailand on February 12, 2014 by Julie. That looks like a lot of fun actually. You can tell how much we enjoyed it by the huge grins on our faces in all of the photos :). 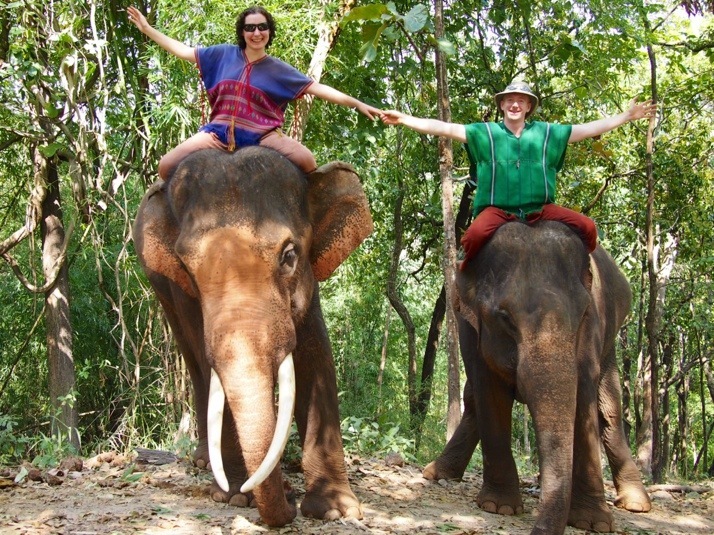 It was really interesting to be learning about and interacting with the elephants, not just turning up and riding them – we would happily have spent several more hours there. That looks amazing!! What a fabulous experience! I would thoroughly recommend it! What is 18 + 22 ?